A Capital Gazette reporter organized the fundraiser at the Crooked Crab Brewery Company to celebrate the local paper that has played a special role in the community. ANNAPOLIS, Md. 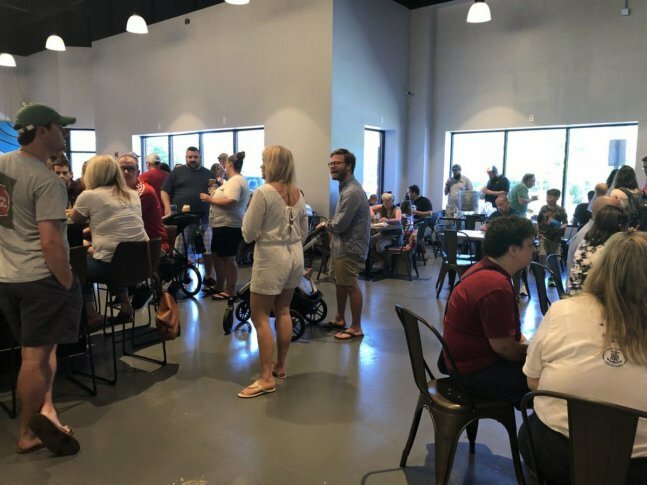 — A local reporter with the Capital Gazette and a brewery in Odenton, Maryland, joined forces Sunday to raise funds for those impacted by the Capital Gazette shooting. Liz Murphy works as a community correspondent for the paper covering breweries and beer. She organized the fundraiser at the Crooked Crab Brewery Company to celebrate a local paper that has played a special role in the community. All proceeds from the fundraiser raffle and silent auction, as well as $1 from every pint sold, will go to help those impacted by the shooting. “A lot of today is about remembering the incredible talent and mentorship and beloved family members that we lost. It’s been really inspiring to see how everyone has come together like a family,” said Murphy. Alex Josephs is one of the founders here at the Crooked Crab Brewing Company, which only recently opened doors. He recalled the Capital Gazette reporting on the brewery’s opening. “When we opened, they wrote about us. They said, ‘Hey, tell us about what you’re doing,'” said Josephs. He said celebrating local journalism and showing support was an opportunity he didn’t hesitate to be a part of. “It’s people we know. It’s people we’ve worked with,” said Josephs.